Invite your players to play The Golden Pony . 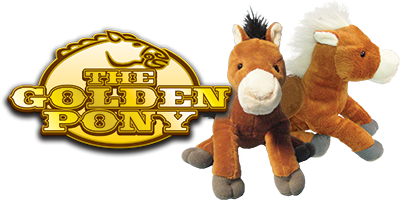 Players earn points on their slot card to pick a pony, Pick a Golden Pony and WIN! Ponies are sealed in an opaque bag so no one knows what ponies are the winners. All Golden ponies are shipped in separate boxes so you determine when to add more winners or they can be added to each box prior to you getting them. You determine the points needed to get a pony and the dollar amount a golden pony is worth. I.E. 5000 Regular ponies and 50 Golden ponies. Your casino is not too small or large for The Golden Pony promotion; our experienced staff can work out the numbers for you. We can even help you determine the pay points. *Game is also offered as “The White Buffalo”. “I was looking for promotions for the floor one day and ran across Specialty House of Creation. One thing I would like to say is if Chip says it is a good promotion you can believe him. I asked about many of the promotions and he directed me to what he thought would work best for our site. I ended up getting the Pony Promotion which is little stuffed ponies with scratch off tickets hooked to their ears. I have never seen anything like it. We ordered 2000 ponies it is the second week into the promotion and have gone through 3/4 of our stock. We are a smaller Casino so I thought that would be plenty. But our players love them. They keep playing until they can get another pony. I will run this promotion again in the near future with a start point of 5000 animals.